The Asian Platform for Global Sustainability & Transcultural Studies (AGST) was established with the goal of equipping globally minded researchers and students with the capacity to contribute to sustainable development in Asia and throughout the world. It forms part of the social sciences and humanities under the banner “Japan Gateway: Kyoto University Top Global Program” (JGP) and involves the three Graduate Schools: Economics (GSE), Letters (GSL) and Agriculture (GSA: Division of Natural Resource Economics). Our Working Paper Series (AGST-WPS) currently disseminates research relevant to Environmental Policy & Rural Development Studies (AGST Module 1), Business History & Industry Policy Studies (AGST Module 2), Developing & Emerging Economies Studies (AGST Module 3) and Asian & Transcultural Studies (AGST Module 6), but will expand into other areas (International Trade & Financial Studies; Business Management & Accounting Studies) on the basis of future international partnerships. 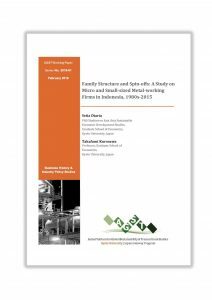 The series provides a conceptual and empirical foundation for the ongoing research projects at Kyoto University and our partner universities. The Working Papers track the progress of our research and are meant to stimulate discussion and contribute to the advancement of a multidisciplinary perspective on Global Sustainability and Transcultural Studies. 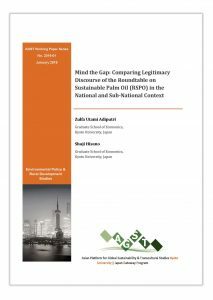 The findings, interpretations, and conclusions expressed in the AGST’s WPS are entirely those of the author(s) and do not necessarily represent the views of the AGST, Kyoto University and/or our partners. Submission of Working Papers is open to all faculty members, researchers, and Students (doctoral and master’s) of the GSE, GSL and GSA, as well as their partner universities as long as the topic of the paper aligns with one or more of the above-mentioned Modules and its quality measures up to the standard of the Working Paper Series. Graduate students wishing to publish a single-authored paper or joint paper with other student(s) should be pre-screened by their university advisor(s) before submitting their manuscript to the editorial board. Since this Working Paper Series is part of the international collaboration for graduate education between Kyoto University and partner universities, prospective authors are strongly encouraged to develop joint international papers with students and faculty members from among all of the partnering universities. Draft working papers should be submitted to the AGST-WPS electronic form. After the registration, a confirmation email will be sent to the author with a link where the paper should be uploaded. Draft papers written only by graduate students shall be submitted to one or two reviewers from the Scientific Committee. Although the draft papers would be accepted and published online as soon as possible if they meet the minimum standard requirements for the Working Paper Series, the comments would be sent back to the author/s for revision of the papers as needed. For more detailed information on Guide for Authors, please refer to the PDF file.